Buckle your seatbelts and take a ride back to the not-so-distant past, and learn about videotape recording before the invention of VHS! Find out that a machine that can now be built inside a portable camera used to weigh 2200 pounds! All this, and more at Quadruplex Park! Updated 10-19-2004 Updated equipment/want list. Email address updated. 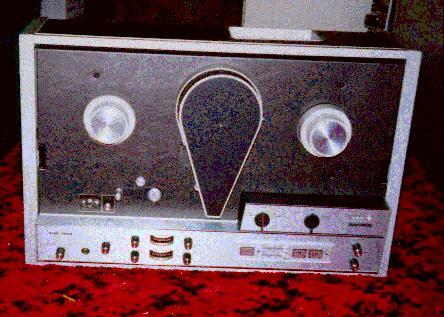 This was an early high-performance quad VTR built by Ampex. It is three racks long, and weighs approximately 1300 pounds. The machine I have had to be sawn in two to get it into the basement! (Word of advice: don't try this unless your'e desperate!) This machine has been almost completely restored and is in excellent operating condition. Much of the restoration work was done by another collector, Nolan Stephany. This machine originally came from a Canadian TV facility. This was probably the most popular quadruplex VTR ever built, and a handful of them are still in service. 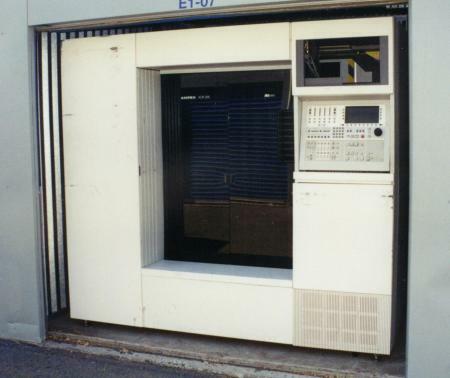 The VR1200 came in three flavors; the 1200, B, and C. The machine pictured here is a 1200B that came from Syracuse University in Syracuse, NY. It only had 512 operating hours on it when I acquired it, and the machine was like new. (It was in a remote truck that was rarely used.) It is 100% functional, except for the usual age-related problems. This is a true collector's item. I have a second VR1200 that came from WUHF TV in Rochester, NY. It is nearly operational, but I haven't put a lot of time into it lately because it is in an awkward spot in the basement, and the cieling's too low for the monitor bridge. This is truly the king of quad machines! Weighing in at a sprightly 2200 pounds, the AVR-1 is a behemoth! It requires 220 volts at 22 amps for power, and 1.5 scfm of compressed air at 45 PSI if you choose to use an external compressor. (ALWAYS a wise idea, especially for collectors.) 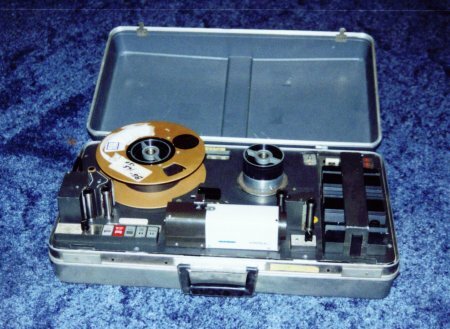 But, it will lock up from 'ready' in 1/5 of a second, can handle any combination of reel sizes, auto-detect any tape standard, and play a tape with no control track! It is also the first machine to contain something that resembles a modern timebase corrector. (It employs switched glass delay lines.) I don't know the exact origin of my machine, but it undoubtedly came from a TV station in central NY. It is 100% operational, except for a few 'bugs' to be expected of any machine of that age! 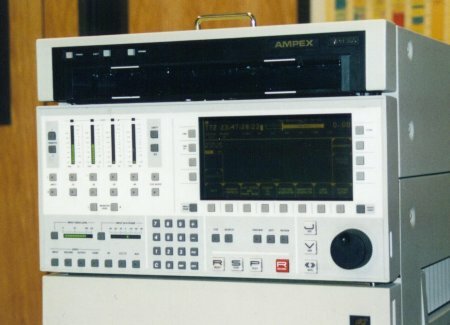 The Ampex VPR-300 is a D2 format digital production recorder. 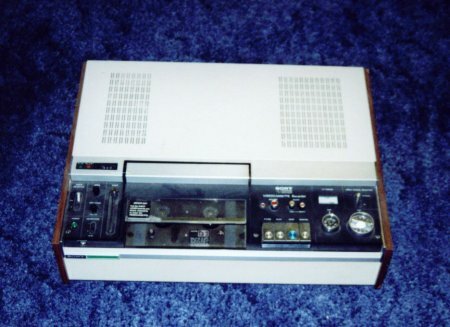 It was Ampex's first digital standalone VTR product. It is a deluxe, high performance editing machine with all the features you would expect from a top-of-the-line digital editing machine. However, it suffered the fate of all composite digital VTRs-- it ws obseleted by digital compression and it's requirement of component video. I obtained this machine in a trade with another collector for one of my AVR-2's. It is in good working order, with just a couple of minor problems. There will be a webpage devoted to this machine in the near future. This is a very rare 2 inch, 1 head helical machine by Sony. It was manufactured in 1966, and was way ahead of it's time. It is very heavily built, and has most of it's electronics on plug-in cards. Shortly after getting the machine, I was lucky enough to get a reel of tape for that format. Apparently, this format was popular for a short while, but then disappeared into video oblivion. I do not know where the machine originally came from. Sony Two head, One inch helical VTR's. Here are two really unusual Sony one inch two-head helical machines. This format must have been popular for a while, as these seem to pop up every now and then. A local college may even have a library of tapes in this format. 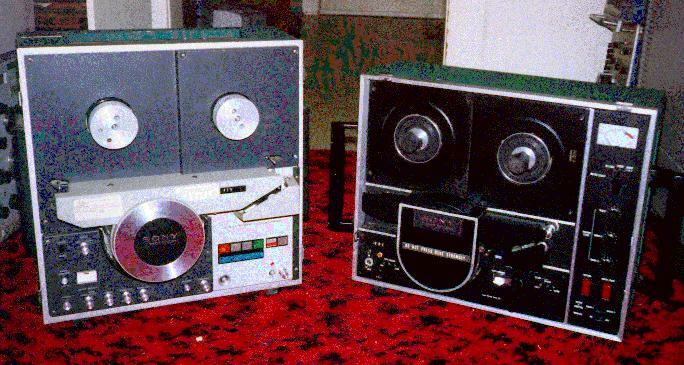 The machine on the right, a Sony model EV-200, was manufactured in 1972. What is really unique about this machine is the use of a vaccuum tube motor drive amplifier! (The rest of the machine, and the entire other machine is solid state.) The EV-200 has no evidence that it was ever used! I do not know the origin of this machine. The other machine, a Sony EV-310, may have come from the National Institute for the Deaf (NTID) in Rochester, NY. 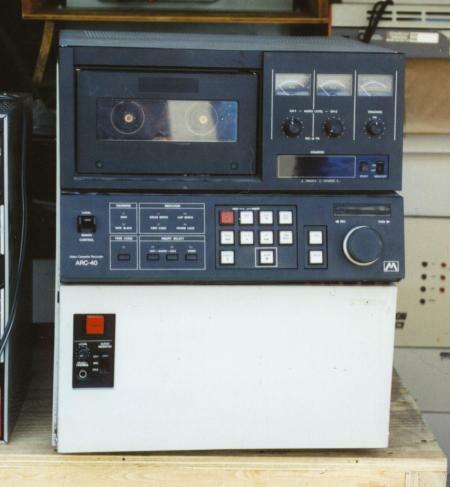 The Ampex VPR-2B is a one inch, 'C' format machine that was extremely popular in the early '80's. It's design is based on the VPR-1, an 'A" format machine that was later converted to type 'C'. It is intended for heavy duty editing, and it has full confidence heads for video. 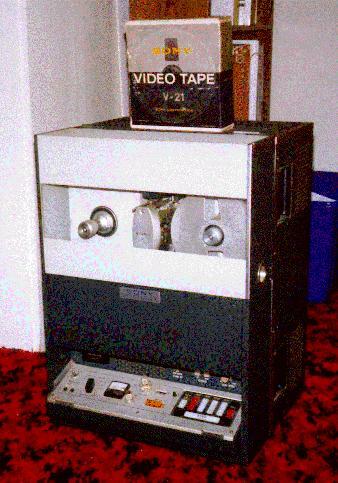 This machine also features AST (Automatic Scan Tracking), which allows the video heads to follow a nonstandard track on the tape. This feature gives the machine the ability to do high quality slow motion and reverse motion. This particular machine is also wired for full sync heads, but they are not installed at this time. 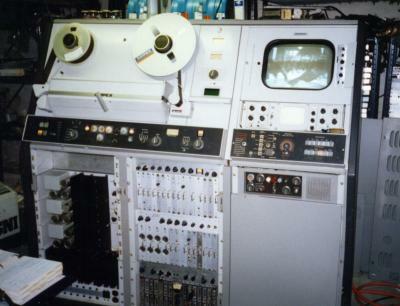 The timebase corrector with the machine is an Ampex TBC-2B, which gives the machine fully timebased-corrected slow motion fron -1/2 to + 1 1/2 times normal speed. This machine came from WXXI TV in Rochester, NY, where it had been under my care for some years. It was one of the slo-mo machines in our remote unit. The white label on the head cover is slo-mo instructions for operators not familiar with these old machines. The VPR-3 is to 1" type C what the AVR-1 is to quad. Considered the finest analog VTR ever in popular use (Many argue the IVC 9000 is the very best, but only 66 were made, and only a couple still exist. ), over 3,000 of these machines were made. This machine features many things borrowed from the AVR-1: Air lubricated guides, vaccuum capstan, super fast shuttle, and automatic everything. When used with a Zeus TBC, even color framing errors could be invisibly corrected. The AST features a true frame mode at slower speeds and still. The servo system's tape handling is so precise that a 10 second spot can be frame-accurate recued in six seconds. 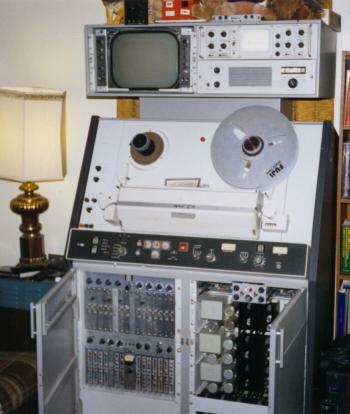 The audio system includes many features found only on the finest audio tape machines, such as full auto alignment, external processing loop (This machine came with a Dolby 'A' processor to put in the external loop), and resonance tuning on the erase heads to ensure full depth of erasure. Other features include multiple search-to-cue, direct keyboard entry of cue points, continuous diagnostics, SCH phase meter, and a tape protection system that will stop the tape from the fastest shuttle speeds in the event of a power failure. (The machine does not even have parking brakes beacuse of the fully servoed tape handling.) There's even a provision for the system control to trip the main power breaker if a serious motor driver or supply voltage problem occurs! 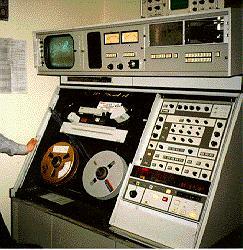 This machine came from PBS Technical Operations Center in Alexandria, VA. 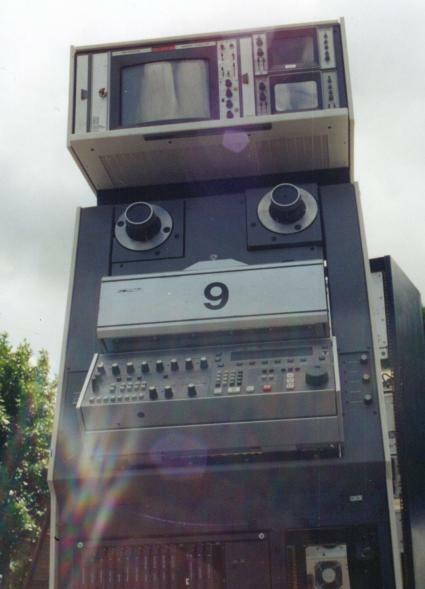 It is VTR 9, which places it as one of the main on-air origination machines. It is currently inoperative, with a severe system control problem. This is a three 1" plumbicon studio camera. I have two of these cameras, and parts of a third. They were a very common camera in the early '70's. I have yet to start restoring these cameras, but I suspect that it will make restoring the quad machines seem easy! If you think quad heads are hard to come by, just try getting a set of good camera tubes! These cameras came from WXXI TV in Rochester, NY by an incredibly cirqutious route. Interestingly enough, BTS (What Norelco is today) bought back one of the PC-70's that originally belonged to WXXI and has had it (Fully restored and operational) at the NAB convention. It would be impractical to have every piece of equipment in the collection show up on this page as an image. It would take too much time for the site to load! So, much of the equipment below can be seen by clicking on it's link. 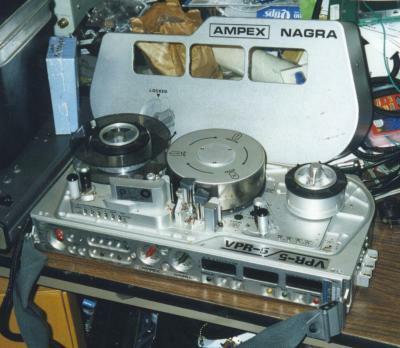 Ampex VR5800 and XVR5800 1" type 'A' VTR's. 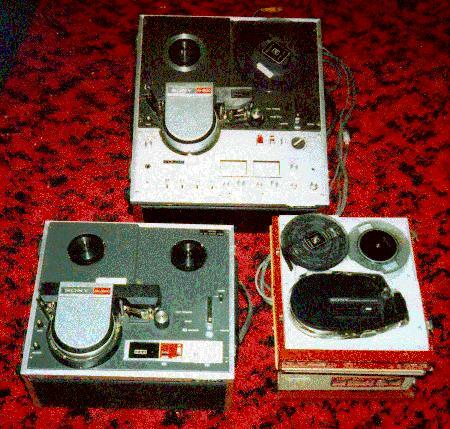 Ampex VPR-5 and Sony BVH-500 portable 1" type C VTR's. New!Ampex VPR-20 portable type C machine. 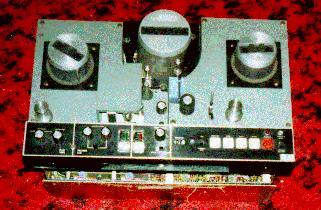 An M-format VTR (Ampex ARC-40, but built by Matsushita). 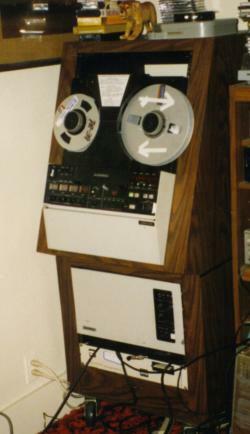 2 Ampex AVR-3's. These are equipped with super high band. New!Ampex VR3000 portable quad VTR. New!Sony HDV-1000 full bandwidth analog HDTV VTR. Sony BVU-820 U-matic VCR with slo-mo. Teac/Sony modified VO-2850. Machine has wideband signal system. (no color) and precision slow-mo speeds. (No DT). New!Sony VO-5830 tri-standard U-matic VCR. 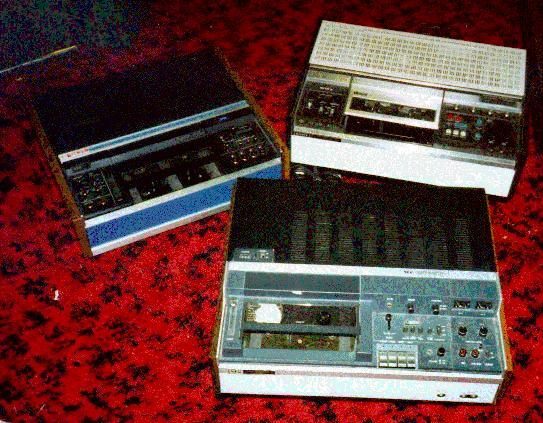 New!Sony VO-1800 that was the personal 'home VTR' of the Scripps family! Ampex/Panasonic AU-300 M format studio deck! Sony AVC8650 1/2" EIAJ VTR, color, full editing. Works well. Picture of the above two machines. 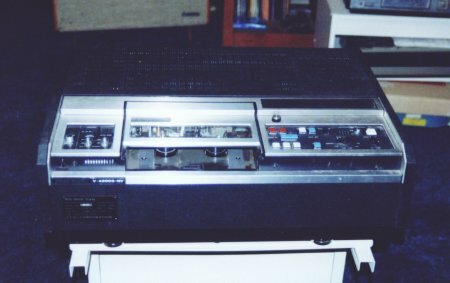 Concord VTR-1120 color EIAJ VTR (Panasonic chassis). IVC 810 1" helical VTR. 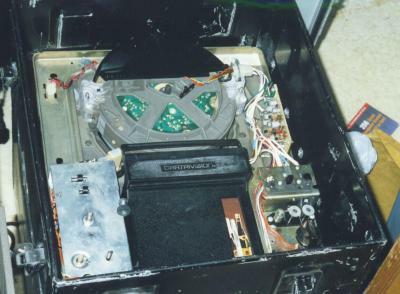 Cartrivision - Early consumer VTR. 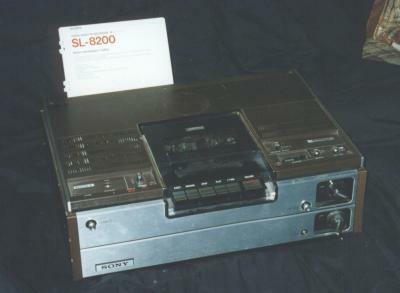 Sony SL820REF="betamax.jpg">Sony SL8200 early Betamax consumer VTR. - My very first VTR! Various old industrial Betamax machines. New!Quasar 'Great Time Machine' consumer VCR. Grundig 'Video 2 x 4' Video 2000 consumer VCR. 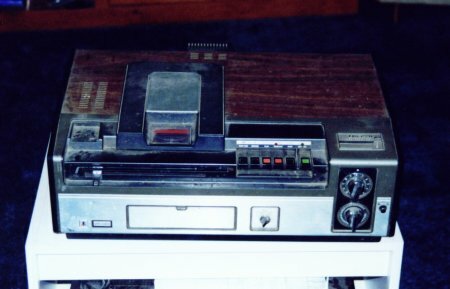 An RCA quad tape eraser. Grass Valley 10 x 12 routing switcher. Central Dyamics master control switcher. New! Central Dynamics CD680 model 4 switcher, removed from KNPB! Sony BVT-810 TBC for BVU-800 series. New! Digital Video Systems DPS-1 frame synchronizer. Ampex external color stabilizer for type A machines. New! IVC encoder, set up as sync/bar generator. Telemet pulse and video DA's. Various Grass Valley 900 series DA's and sync generator/proc amp modules. New! 2 Vidifont Graphics V's. One of these is a unit I trained on back in 1984! Chyron RGU with font compose option. Chyron 4200 with dual channel, motion, hard disk, camera capture and font compose options. Just about anything Conrac made in the late 60's/early 70's! Here are the top ten most wanted items for the collection. Do you know of any of these items looking for a new home? 2. Any early HD VTRs, analog or digital, especially Sony HDD-1000. 3. 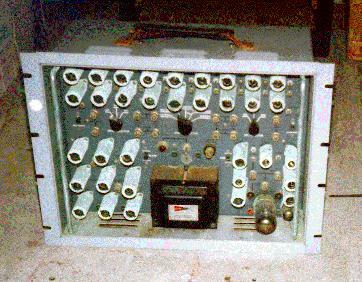 RCA TG-1 Sync Generator. 5. Any type B VTR. 6. Any military VTR, especially for in-flight use. 7. CVC (Technicolor) 1/4" VCR. 8. Any very early CG's. 9. Ampex VR1500 or VR660. 10. Any European consumer VCR, Except Video 2000.